As I mentioned here in late October, ActiveMQ In Action entered Manning's pre-production process, the final process of review and editing before actually printing the book. While working through this process, I was asked to write an article for TomcatExpert.com website so I decided to pull a bit of content from one of the chapters that discusses integrating ActiveMQ and Tomcat. The first article in the three-part series was published titled, ActiveMQ and Tomcat: Perfect Partners. The first article briefly introduces ActiveMQ and the second and third articles provides the details on integrating ActiveMQ with Tomcat using both local JNDI and global JNDI. These two approaches are unique enough and the integration process tricky enough that this info was determined to be good content for an article. The second article in the series is named Integrating ActiveMQ With Tomcat Using Local JNDI . It covers the integration of ActiveMQ using a local JNDI context. I've had many people come to me who have encountered issues with this style of integration, so I know it can be confusing. The third article in this series is Integrating ActiveMQ With Tomcat Using Global JNDI and it focuses on configuring JMS resources using global a JNDI context. The global JNDI configuration can be rather difficult because it is a container-wide deployment instead of contained inside of a single web application. The example application used in the articles comes straight from chapter 8 of ActiveMQ In Action and uses a simple message flow. An HTML form is used to post a message to a queue in ActiveMQ that is consumed by the Spring message listener container. Whereas this example model is simple to demonstrate the power lies in using this model in a more distributed manner and/or with a stand alone ActiveMQ instance. This topic is popular enough that I've been asked numerous times about so I guess it's a good thing it was included in the book. Just in time for the holidays, you can get 40% off your purchase of ActiveMQ In Action! Just use the coupon code *activemq40* at the time of checkout. Enjoy! 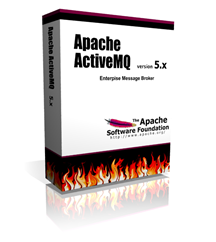 Apache ActiveMQ 5.4.0 was released in August, followed quickly in September by a 5.4.1 release. Not only were there tons of fixes in these releases, but there were also some really great new features including message scheduling, support for web sockets, new Unix control scripts, full message priority, producer message caching and cluster client updates and cluster client rebalancing just to name a few. In this blog post, I'm going to discuss the new cluster client updates and cluster client rebalancing features so that you get a taste of how they are used. When using a network of brokers with ActiveMQ, the configuration of the brokers that form the network has always been rather static. The first step toward a more dynamic network of brokers was a feature I presented in a previous blog post titled How to Use Automatic Failover In an ActiveMQ Network of Brokers. In the event of a broker connection failure, the use of the failover transport for the network connections between brokers allows those connections to be automatically reestablished. This is a wonderful feature for sure, but it only got us part of the way toward a truly dynamic cluster of brokers. Both of these features are quite interesting so I will explain how each one works. The failover configuration example above lives on the client side and contains a static list of the URIs for each broker in the cluster. In the event that a broker in the cluster fails, the failover transport is what allows a client to automatically reconnect to another broker in that list of broker URIs. Unfortunately this style of configuration can be difficult to maintain because it is static. If you want to add another broker to the cluster, every client's failover transport configuration must be updated manually. Depending on the number of clients in your cluster, this could really be a maintenance headache. This is where the first new features comes to the rescue. updateClusterClientsOnRemove - Updates a client when brokers are removed from the cluster. updateClusterFilter - A comma-separated list of regexes to match broker names that are part of the cluster. This allows flexibility for the inclusion/exclusion of brokers. updateURIsURL - Used to provide the path to a file containing a comma-separted list of broker URIs. These new features are extremely powerful because they allow for a much more dynamic network of brokers configuration. Anyone who has had to deal with the static nature of the failover transport configuration should understand the power in these new features and do some experimentation to see how they operate. The second new feature also builds upon the failover transport configuration, but for a slightly different purpose. Consider the fact that when a new broker is added to/removed from the cluster that clients cannot automatically take advantage of it. Even with the new ability to update the clients so that they have knowledge of the broker being added/removed, there was no way previously for them to actually use that broker unless a failure occurred. Well that's what this feature does. Notice the new rebalanceClusterClients attribute in the <transportConnector> element. This property enables the clients to immediately take advantage of the new broker in the cluster. Instead of waiting for the next connection failure and a reconnect from the failover transport, the clients are told to reconnect immediately to another broker in their list. Due to the two new properties that have been set on the broker-side, each client will be notified of the new broker that was added to the cluster AND each client will automatically reconnect. That is, the functionality of the failover transport will be engaged so that each client is disconnected from the current broker and reconnected to another broker in the list (i.e., the list of broker URIs in the failover transport configuration). The updateClusterClients property is working correctly because you should see the logging change from one broker URI to another. Remember that each client was started with only one broker URI in their failover transport config. The fact that they are reconnecting tells you that they are receiving notifications of changes to the cluster. The rebalanceClusterClients property is working properly because the clients reconnected. Verify this using the logging from each client. You will see that each client was sending or receiving messages to/from one broker URI and suddenly the logging changes to another broker URI. This tells you that the clients are being updated and rebalanced. These new features are quite powerful additions to the ActiveMQ network of brokers. They really advance ActiveMQ beyond the static configurations upon which we have all relied for many years now. Most likely the sys admins and dev ops folks will enjoy these features the most because they will no longer need to manually manage a static list of broker URIs for clients. As I said earlier, many other great features were also introduced in ActiveMQ 5.4 and 5.4.1. So try them out yourself to see if they help to improve your application development. Update: If you only set the updateClusterClients="true" and the rebalanceClusterClients="true" options, you will notice that when a broker in the network fails and is brought back up, the client connections to other brokers in the network are not automatically rebalanced. This is due to the lack of the updateClusterClientsOnRemove="true" option. After adding this option to the config, network broker clients are notified of broker failures which basically completes the circle and allows the automatic rebalancing to work as it should. 40% Off ActiveMQ In Action To Celebrate Going Into Production! 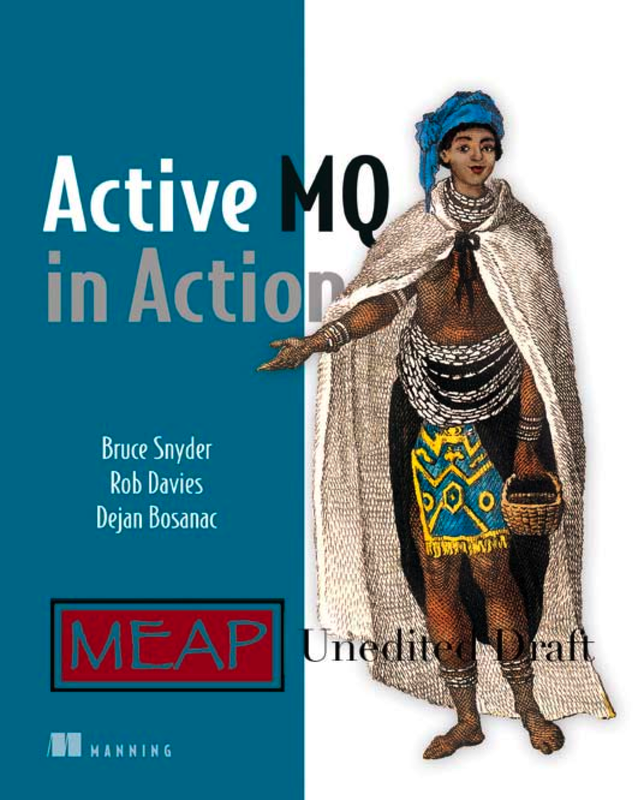 Good news -- ActiveMQ In Action has now entered the Manning production process! This means that we are done with the writing of content for the book and it is currently being copy edited and undergoing technical review. In fact, we are currently seeking reviewers for the book. If you are interested to review the book, please send an email to mkt@manning.com. Also, we are currently offering 40% off your purchase of ActiveMQ In Action! Just use the coupon code *activemq40* at the time of checkout. Hurry and make your purchase today as this discount won't last long! Last week I attended our annual SpringOne 2GX developer conference and I saw many excellent presentations by many different folks. As is common at a developer conference, there were numerous times where I was torn by the decision to attend one talk and not another due to time scheduling. Probably the most intriguing talk I attended was a Technical deep-dive of hypervisors and virtualization for developers by Richard McDougall. I learned a lot about virtualization that I didn't know and, as always, Richard's depth of knowledge on this topic is completely impressive! But my favorite talk was one delivered by my friends Dave Syer and Mark Fisher titled Concurrent and Distributed Applications with Spring. I always enjoy discussions, books, articles, etc. on the topic of Java concurrency, but Dave and Mark's session was different. In the same vein as the Java Concurrency in Practice book, Dave and Mark brought a practicality to the topic that really scored a goal with the attendees. When I go to conferences I tend to judge sessions not solely based on my own opinion, but moreso on the opinion of other attendees. Not only was this session completely packed, but it stayed packed the entire time, i.e., people were not walking out early. This was due to the way that Dave and Mark delivered a difficult topic in a way that all Java developers can understand. What many of the conference sessions, books, articles, etc. have in common when presenting Java concurrency is that they don't seek to simplify the content and present it in a way that makes it easier to understand. Dave and Mark really tore down most of the complexity with Java concurrency and presented it in a way that makes it seem approachable. In fact, I saw more people taking notes in this session than in any other that I attended. They also provided hands-on examples that were simplified and to the point. I think that they could have gone on discussing this topic for another 90 minutes and people would have stayed. Now, aren't you jealous that you weren't there?! 50% Off ActiveMQ In Action! 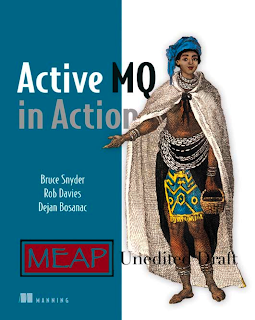 The ActiveMQ In Action book has made available a new early access release before going into final review and copy editing. All 14 chapters are included in this MEAP release. 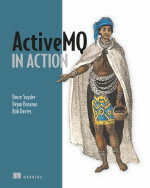 For a limited time you can get the definitive book on ActiveMQ at a 50% discount! Just use the coupon code *activemq50* at the time of checkout. Hurry and get this discounted price while it lasts because this offer expires on Monday, May 31, 2010. I want to purchase ActiveMQ in Action today! In a previous blog post titled Using Spring to Receive JMS Messages, I introduced the use of the Spring default message listener container for asynchronous consumption of JMS messages. One very common discovery that folks make when first using JMS is that producers can send messages much faster than consumers can receive and process them. When using JMS queues, I always recommend the use of more consumers than you have producers. (When using JMS topics, you should only use a single consumer to guard against receiving the same message multiple times.) This is a normal situation with message-oriented middleware (MOM) and it is easy to handle if you are using the Spring message listener container. Notice the concurrency="10-50" property above. This is a simplified configuration for setting the concurrentConsumers=10 and the maxConcurrentConsumers=50 properties of the DMLC. This tells the DMLC to always start up a minimum of 10 consumers. When a new message has been received, if the maxConcurrentConsumers has not been reached and the value of the idleConsumerLimit property has not been reached, then a new consumer is created to process the message. This behavior from the DMLC continues up to the limit set by the maxConcurrentConsumers property. When no messages are being received and the consumers become idle, the number of consumers is automatically decreased. You should not increase the number of concurrent consumers for a JMS topic. This leads to concurrent consumption of the same message, which is hardly ever desirable. Within each task execution, a number of message reception attempts (according to the "maxMessagesPerTask" setting) will each wait for an incoming message (according to the "receiveTimeout" setting). If all of those receive attempts in a given task return without a message, the task is considered idle with respect to received messages. Such a task may still be rescheduled; however, once it reached the specified "idleTaskExecutionLimit", it will shut down (in case of dynamic scaling). Raise this limit if you encounter too frequent scaling up and down. With this limit being higher, an idle consumer will be kept around longer, avoiding the restart of a consumer once a new load of messages comes in. Alternatively, specify a higher "maxMessagesPerTask" and/or "receiveTimeout" value, which will also lead to idle consumers being kept around for a longer time (while also increasing the average execution time of each scheduled task). idleTaskExecutionLimit - The limit for the number of allowed idle executions of a receive task. The default is 1 causing idle resources to be closed early once a task does not receive a message. maxMessagesPerTask - The maximum number of messages to process in a single task. This determines how long a task lives before being reaped. The default is unlimited (-1) so you may not need to change this property. receiveTimeout - The timeout to be used for JMS receive operations. The default is 1000 ms.
As I noted above, in the Spring 3.x trunk, the idleConsumerLimit property was clarified a bit recently and exposed as a writable property. This is yet another property for tuning for situations where you need to ramp up the number of concurrent consumers faster. In the example configuration above, the receiveTimeout property is set to five seconds to tell the DMLC's receive operation to poll for message for five seconds instead of the default one second. Also, the idleTaskExecutionLimit property is set to 10 to allow tasks to execute 10 times instead of the default value of 1. Lastly, the idleConsumerLimit property specifies the limit on the number of idle consumers. This property can be used to more aggressively ramp up the number of concurrent consumers. By caching at the consumer level, this means that the connection, the session and the consumer is cached. Notice that the cacheLevel property can be used with the Spring JMS namespace style of XML configuration. The session is cached based on ack-mode and the consumer is cached based on the session, the selector and the destination. It's necessary to know this info to better understand where/when the JMS resources can and cannot be reused. For example, caching consumers that use different selectors and consume from different destinations is only going to be relevant if you partition these items appropriately for reuse. That is, you may need to use a separate connection and listener-container configuration if the cache keys are different and if you want to cache sessions or consumers for reuse. The overall point of the caching is that it can help to reduce the potential recurring thrash involved in creation and destruction of JMS resources. Reducing the thrash by using caching and employing the appropriate partitioning of these resources so as to allow for reuse can definitely improve the overall performance of the application. Hopefully this post helps you understand how to tune JMS message consumption in Spring. As you employ Spring JMS to your applications and experiment further and further, you will discover how much the DMLC is actually doing for you and how many more features it has beyond what you can easily build yourself. Have you ever had a need to create your own JMS consumer? Or will you have this need in the future? If you answered yes to either one of these questions, this post will simplify your life. In the previous post, I discussed Using the Spring JmsTemplate to Send JMS Messages. As a follow-on, in this post I will demonstrate how to receive messages using Spring JMS. Although the previously mentioned JmsTemplate can receive messages synchronously, here I will focus on asynchronous message reception using the Spring message listener container architecture, specifically the DefaultMessageListenerContainer. The DefaultMessageListenerContainer (DMLC) is another wonderful convenience class that is part of the Spring Framework's JMS package. As you can see in the Javadoc, the DMLC is not a single class, but a well-abstracted hierarchy for the purpose of receiving messages. The reason for this is that the DMLC takes its inspiration from Message Driven Beans (MDB). For some situations, it is important to understand the additional error handling and the redelivery semantics that are provided by the DMLC. For more information, see the AbstractMessageListenerContainer JavaDoc. The reason I recommend the DMLC (or even the SimpleMessageListenerContainer) is because writing JMS consumers can be a lot of work. In doing so, you must manually handle and mange the JMS resources and the JMS consumers, any concurrency that is necessary and any use of transactions. If you've ever done such work you know how arduous and error prone it can be. Certainly MDBs provide some of these features but with all their disadvantages. By creating MDPs using the Spring DMLC, I have seen users save a tremendous amount of time and increase their productivity significantly. This is because the DMLC offers much flexibility, robustness, a high amount of configurability and it has widespread deployment in businesses all over the world (so it has been widely tested). For folks who are already familiar with the Spring Framework, the XML above is quite straightforward. It defines a connection factory bean for ActiveMQ, a message listener bean and the Spring listener-container. Notice that the jms:listener contains the destination name and not the listener-container. This level of separation is important because it means that the listener-container is not tied to any destination, only the jms:listener is. You can define as many jms:listener elements as is necessary for your application and the container will handle them all. The javax.jms.MessageListener - This is what was used in the example above. It is a standardized interface from the JMS spec but handling threading is up to you. The Spring SessionAwareMessageListener - This is a Spring-specific interface the provides access to the JMS session object. This is very useful for request-response messaging. Just be aware that you must do your own exception handling (i.e., override the handleListenerException method so exceptions are not lost). The Spring MessageListenerAdapter - This is a Spring-specific interface that allows for type-specific message handling. Use of this interface avoids any JMS-specific dependencies in your code. So not only is the Spring message listener container easy to use, it is also full of options to adapt to many environments. And I've only focused on the DefaultMessageListenerContainer here, I have not talked about the SimpleMessageListenerContainer (SMLC) beyond a simple mention. At a high level the difference is that the SMLC is static and provides no support for transactions. One very big advantage of the Spring message listener container is that this type of XML config can be used in a Java EE container, in a servlet container or stand alone. This same Spring application context will run in Weblogic, JBoss, Tomcat or in a stand alone Spring container. Furthermore, the Spring DMLC also works with just about any JMS compliant messaging middleware available. Just define a bean for the JMS connection factory for your MOM and possibly tweak a few properties on the listener-container and you can begin consuming messages from different MOMs. I should also note that the XML configuration is certainly not a requirement either. You can go straight for the underlying Java classes in your own code if you wish. I've used each style in various situations, but to begin using the Spring DMLC in the shortest amount of time, I find the Spring XML application context the fastest. Update: I have made all of the code for these examples available via a GitHub repo. Recently I stumbled upon a number of places in the some docs and mailing lists where claims are made that the Spring JmsTemplate is full of anti-patterns, is horribly inefficient and shouldn't be used. Well I'm here to debunk these erroneous claims by pointing out a class in the Spring Framework that was overlooked entirely. The Spring JmsTemplate is a convenience class for sending and receiving JMS messages in a synchronous manner. The JmsTemplate was originally designed to be used with a J2EE container where the container provides the necessary pooling of the JMS resources (i.e., connections, consumers and producers). Such requirements came from the EJB spec. But when developers began using the JmsTemplate outside of J2EE containers, and because some JMS providers do not offer caching/pooling of JMS resources, a different solution was necessary. Enter the Spring CachingConnectionFactory. The CachingConnectionFactory is meant to wrap a JMS provider's connection to provide caching of sessions, connections and producers as well as automatic connection recovery. By default, it uses a single session to create many connections and this model works very well with most MOMs. But if you need to scale further, you can also specify the number of sessions to cache using the sessionCacheSize property. As you can see, the configuration for the CachingConnectionFactory along with the JmsTemplate is quite simple. Furthermore, these two classes are also both in the org.springframework.jms package path so they're both included in the spring-jms jar file making their use even easier. The SimpleMessageProducer class above demonstrates the use of Spring autowiring to resolve the relationship between the jmsTemplate property and the producerTemplate in the app context further above. Then an anonymous MessageCreator instance is used to actually create a message for the jmsTemplate to send. The JmsTemplate and the CachingConnectionFactory are both very widely used in businesses of all sizes throughout the world. Coupled with one of the Spring message listener containers, they provide an ideal solution. I'll elaborate on message consumption using the Spring DefaultMessageListenerContainer and the SimpleMessageListenerContainer in a future blog post. Update: Here is the tarball of ActiveMQ configurations used for this blog post. Last week I tested a new feature in ActiveMQ 5.3.0 to support automatic failover/reconnect in a network of brokers. Besides adding this information to the ActiveMQ book, one person also suggested that I also post it on my blog for easier access, so here you go! Folks familiar with ActiveMQ already know that a network of brokers allows many broker instances to be networked for massive scalability. Prior to the addition of this feature in ActiveMQ 5.3, if one of the brokers in the network went down, reestablishing a connection with that broker when it comes back up is a manual process wrought with difficulty. By adding support for failover to the network of brokers, any broker in the network can come and go at will without any manual intervention. A very powerful feature, indeed. Although this post is long, the outcome of the testing is well worth it. The first thing to note is the topology for the network of brokers. I used a network of three brokers named amq1, amq2 and amq3. The attached diagram explains the topology, including the consumers and producers. amq1 and amq2 are stand alone with no network connector. amq3 defines a network connector with failover to amq1 and amq2. Consumers exist on amq1 and amq2. Producer will connect to amq3. To start with, I have only configured a uni-directional network connector in amq3. Later I will change the configuration for a bi-directional network connector. Thanks to the ability to upload any file to Google Docs this week, you can download the configuration files for the three brokers. 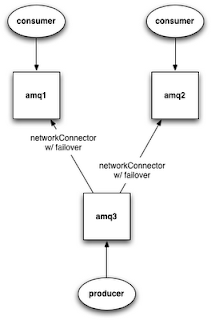 Thanks to the configuration of the ActiveMQ logging interceptor, you should see that amq3 makes a network connection to either amq1 or amq2. For the rest of these steps, let's assume that amq3 connected to amq1. You should see 2000 messages sent to amq3. The messages should be forwarded to either amq1. The consumer connected to amq1 should have received the 2000 messages and shut down. Note the logging that shows the failover taking place successfully. Let's test it to see if the demand forwarding bridge actually got started. You should see 2000 messages sent to amq3. The consumer connected to amq2 receives the 2000 messages and shuts down. Again, the failover took place successfully. Let's continue just a bit further to see if it will continue to failover if I bring up amq1 again. You should see 2000 messages sent to amq3. The consumer connected to amq1 receives the 2000 messages and shuts down. With this minor change in configuration, the network connector is now bi-directional. I.e., communication between amq3 and whichever broker it connects to is two-way instead of just one-way. This means that messages can be sent in either direction, not just in one direction originating from amq3. You should see that amq3 makes a network connection to either amq1 or amq2. For the rest of these steps, let's assume that amq3 connected to amq1. You should see 2000 messages sent to amq3. The messages should be forwarded to amq1. The consumer connected to amq1 should receive the 2000 messages and shut down. Let's test the duplex capability of the network connector in amq3 now. To do this we'll send messages to amq1 and consume those messages from amq3. You should see 2000 messages sent to amq1. The messages should be forwarded to amq3. The consumer connected to amq3 should receive the 2000 messages and shut down. This proves that the duplex feature is working. Now let's cause a failover/reconnect to take place and run through this same set of steps with amq3 and amq2. Notice the logging that shows the failover taking place successfully so that amq3 connects to amq2 now. You should see 2000 messages sent to amq3. The messages should be forwarded to amq2. The consumer connected to amq2 should receive the 2000 messages and shut down. Now let's test the duplex feature in the network connector. You should see 2000 messages sent to amq2. The messages should be forwarded to amq3. The consumer connected to amq3 should receive the 2000 messages and shut down. This proves that the duplex feature of the network connector works after a failover/reconnect to amq2. This is a great addition to ActiveMQ that really improves the usability of a network of brokers. I already have some very large clients using this feature successfully, some of which are using a network of over 2000 brokers. Hopefully these steps are clear enough to follow for your own use. If you need any clarifications, please contact me.